This is a tell-all expose - a rigorous attempt to plumb the depths of meteorological science to lay bare the inscrutable secrets behind the annual progression of daily air temperatures across the greater Atlanta metropolitan area. A major heat island. 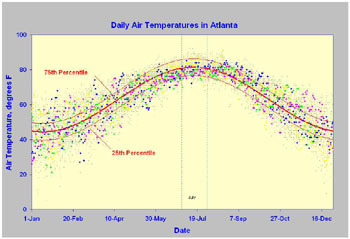 The graph above plots 8500 daily air temperatures recorded by the National Weather Service at the Atlanta Airport from 1980 thru 2003. These are daily average temperatures, mind you, averaged over a full 24-hour day, not the detested afternoon maximums experienced by thousands during their commutations over hot asphalt. C = the seasonal phase shift becomes 4.48. Apparently, in Atlanta the prevailing summer temperatures are much higher than those in winter reaching a maximum in July. However, during any particular year daily maximums can occur just about any time, with winter temperatures up-and-down all over the place. Title: © Atlanta Air Temperatures. When you slice off and eat half a pizza, then slice off and eat half of the remaining half, then slice off and eat half of the remaining portion, and continue slicing and eating 'till infinity arrives, we say the amount of pizza remaining at any time decreases according to the rules of a first order process. Your acid reflux will also follow a first order process increasing gurgitation in response to the disappearing pizza. Pizza reflux is a 'fast' first order reaching finality in minutes. At a different pace, radioactive plutonium-239 decays with a half life of 24,000 years, losing its potency at an incredibly 'slow' rate. Outside, pollutants in our rivers often decay by first order rules extending over days and sometimes weeks. Dump waste water in the river at point A. By the time it reaches point B indigenous bacteria will consume it as food, maybe not by halves, but as a first order process nonetheless. Unfortunately, feeding bacteria also remove dissolved oxygen, again as a first order process, suffocating innocent aquatic life in the way. (Aquatic life can also suffocate rather suddenly; we call that a 'delta function'). Rivers can get reflux too. Folks like me spend our working days (and sleepless nights) trying to understand and quantify the multitude of first order reactions at play in the river at any place, at all times. For the health of the river we must calculate the precise amount of waste water control needed to neutralize any reflux, and regulate unruly first order processes to within very tight limits, for the foreseeable future. No runaway first order processes allowed, in my town! Let's hear it for the Water Scientist.